Gedan Songzanlin Monastery, also called Guihua Monastery, is the largest Tibetan Buddhist monastery in Yunnan province, as well as one of the 13 large lamaseries in the Kangzang region (the combined areas of Tibet, Sichuan and Yunnan). Gedan- highest level of attainment in Buddhism~ or vast ocean in which one must do his or her utmost to learn Buddhism and to reach the shore. 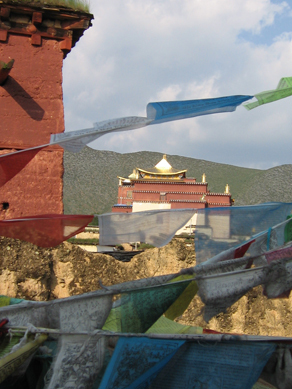 The monastery is 5km from the seat of Zhongdian County. Construction began in 1679 and was completed in 1681. 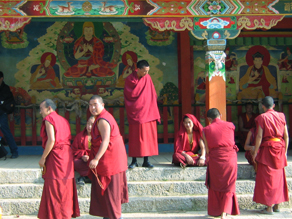 It is said that the Fifth Dalai Lama chose the site of the monastery through divination and named it “Gedan Songzanlin Monastery”. 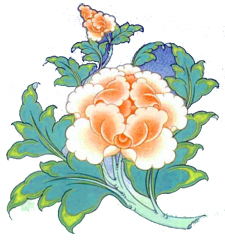 In 1724, during the reign of Emperor Yongzheng in the Qing Dynasty, the monastery was renamed the “Guihua Monastery”. During its time of greatest prosperity there were more than 3,000 monks in the temple. Built along the mountains with a magnificent facade, the present monastery is a faithful imitation of the Potala Palace in Lhasa, Tibet. Covering an area of 33.35 hectares, the monastery has solid walls and five gates. Two main lamaseries, Zhacang and Jikang, command the highest position in the architectural complex. Also listed among the 13 large lamaseries in Kangzang region, they are both Tibetan-style watchtowers and are surrounded by eight sub-lamaseries and the dormitories of the lamas. A five-story Tibetan-style building serves as the main hall in this monastery. Seen from a distance, the gilded copper stupa at the top of the structure and the gilded copper tiles seem to shine eternally in the plateau sunlight. The lower tier in this structure is supported by 108 giant pillars, an auspicious number in Buddhism. The 16 colorful pictures hanging high in the hall are said to have been painted by renowned lamas with golden liquid given by the Fifth Dalai Lama. Brightened with numerous butter-oil lamps, the hall can hold 1,600 lamas sitting in meditation or chanting the Buddhist scriptures. The monastery has many treasures. The most famous are the eight gold-covered sculptures of Sakyamuni, fashioned between the time of the Fifth and Seventh Dalai Lamas. In the early Qing Dynasty, the rulers of Lijiang, the Mu Family, presented the monastery with dozens of bronze sculptures, the “Ganzur” scriptures hand-written in liquid gold, scriptures written on pattra leaves, gold lamps, and many exquisite gilded silver incense burners. Every morning, noon and evening, the solemn tolling of the bells and the sound of the drums from the bell and drum towers can be heard several kilometers away. 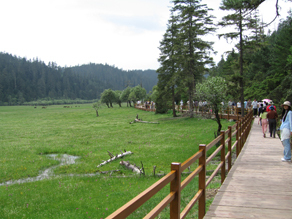 Situated about 32 kilometers (about 19.9 miles) away from Zhongdian County, Bitahai Lake, a fault lake, is an intact natural attraction with various species of flora and fauna and, of course, picturesque landscapes. 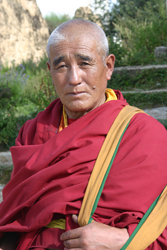 In Tibetan language, Bita means “a piece of land as soft as cattle hair felt”. 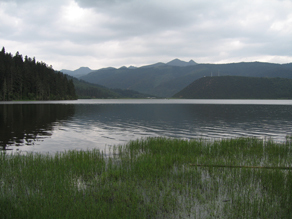 With an altitude of 3,539 meters (about 11,608 feet), the lake is the highest in Yunnan Province. 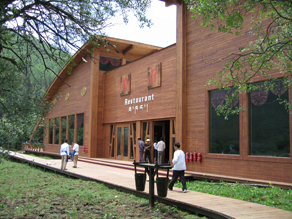 Shaped like lively deer, it also covers an area of 166 hectares. resembles a beryl inlaid among them. The surrounding mountains are densely scattered with azaleas, and each year in late spring and early summer, when the flowers are in full bloom, the hillsides seem to be dyed red, echoing harmoniously with the clear waters in the lake. Bitahai Lake’s fish are as abundant as its natural beauty. Rowing a boat on the lake, one can see shoals of precious “Bitahai Double-Lip Fish” – an ancient species left over from the Fourth Glacial Age – swimming back and forth about 10 meters beneath the surface. The small streams beside the lake are home to amphibious “Codfish”, which produce a valuable medicine. Each year, when azalea blooms cover the mountains, the wind blows the petals into the lake, causing all of the fish to vie with each other to eat them. They eat so many that they seem drunk and float on the surface – an enchanting sight known as “Fish Drunk on Azalea’s Petals”. Around Bitahai Lake are vast meadows and deep forests – ideal habitat for rare animals including red-footed pheasant, silver pheasant, wild bull, leopard and lynx. Every April when the snow begins to melt, wildflowers bloom profusely in the meadows. The glorious colors shine like twinkling stars in a sky of fresh green grass. Local Tibetans pitch their tents in the pastureland and their loyal dogs round up any of the animals who try to stray. In the night, when the day draws to a close, a bright full moon arises above the eastern mountains and over the tops of the trees. From the small cottage of the forest ranger comes the sound of joyous singing and dancing. Bitahai Lake is regarded as a “Holy Lake” by local Tibetans, so keep this in mind and “be on your best behavior when traveling here. Do not litter or act inappropriately, since it is said this type of behavior would disturb the gods and cause them to punish you. “ -from the internet source. These are only some of the many wonderful locations to visit in Shangri-La. As we develop our sight we hope to bring you more information about the region.